Larry is a highly skilled physiotherapist who specialises in treating back and neck pain, postural issues and scoliosis . He is certified in the Schroth Method and through the Egoscue University. Larry has a background in elite gymnastics and springboard diving and also has many years experience in endurance running and triathlons. His specialist knowledge and techniques have seen him appointed as a gymnastics coach and physiotherapist at both the Olympics Games and Special Olympics. His passion and driving philosophy is about achieving the best outcomes for his patients utilising an amalgam of the latest techniques and theories while recognising there may sometimes be a need for invasive procedures. Where deemed appropriate Larry will then refer to a specialist. To further his holistic understanding and approach, Larry is currently undertaking a PhD in Spinal Deformity and regularly attends and speaks at international conferences and courses and clinics. Fun fact: Larry is learning how to surf – so be careful next time you go to the beach! Larry is Level II certified (advanced) in the conservative treatment of Scoliosis based on the Schroth method. The training was conducted by Dr Manuel Rigo of the Barcelona School at Scoliosis Rehab Inc in Wisconsin. He has completed his SEAS scoliosis treatment training at ISICO in Milan. Larry has also spent time working with Dr Rigo in the Barcelona clinic. Larry also has advanced certificates in shoulder treatment, posture alignment therapy and acupuncture. 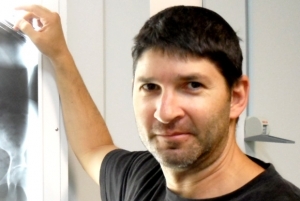 Brendan graduated with a Bachelor of Physiotherapy from the University of Sydney, where he developed a strong habit of evidence-based practice. Brendan is passionate in the philosophy of achieving the best patient outcomes by optimising the body’s own systems to promote healing, backed by the latest evidence. Brendan’s knowledge and interests are in the spine and lower back pain, however, is not limited to this population group. His skills and knowledge have seen him adopt Sports Physiotherapist role in National Futsal championships, UNSW Handball team and junior and senior Western Sydney AFL teams. Brendan specialises in soft and deep tissue massage, exercise prescription, taping, dry needling, spinal mobilisation, manipulation, advice and education, and goal setting. Fun fact: Brendan loves hiking and has hiked many beautiful destinations in NSW! Click here to learn more about our massage therapy appointments. Aimie qualified as a physiotherapist from the University of West of England in 2006, where she specialised early in musculsokeletal physiotherapy. She completed her Masters in Advanced Manipulative Physiotherapy in 2013 from the University of Birmingham, gaining admission to the highly accredited Musculoskeletal Association of Chartered Physiotherapists. 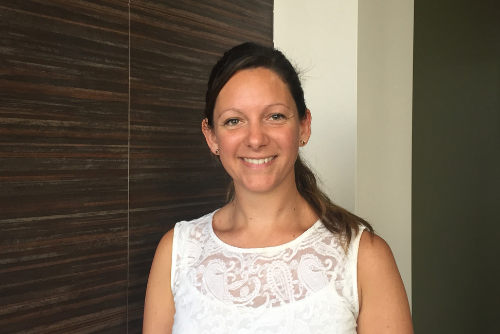 She has worked for the last 6 years as an advanced practice physiotherapist in the UK with a specialist interest in the neck, headaches the upper limb and spine. She worked alongside internationally renowned spinal surgeons, and developed a new model of healthcare where physiotherapists work in an extended role providing steroid injections and prescribing medications in general practice – watch this space Australia! Prior to moving to Australia in September 2017 Aimie also lectured on the Masters program at the University of Birmingham on the cervical spine, whiplash, sacroiliac joint, and headaches. She has published papers in the field of back pain, shoulder pain and nerve injuries and was awarded scholarships from the University of Sydney and the Centre of Research Excellence to complete her Ph.D. investigating neurochemicals in headache, back pain, and whiplash. Fun fact: Aimie has a completely irrational fear of fish, however, has managed to use self-hypnosis to overcome this to complete her diving training up to advanced open water, and complete two shark dives in Fiji. After graduating from the University of Sydney, Shana-Lee worked in various hospitals in ICU, Orthopedics, Neuro Rehab, Pediatrics, Ortho Rehab, Hydrotherapy, and outpatients. Shana-Lee, like Larry, has a background in elite gymnastics and sports aerobics and is internationally certified in the Schroth method of scoliosis treatment as well as advanced training in women’s health related issues. Shana-Lee is one of Australia’s most highly qualified physiotherapists to address pregnancy-related pelvic, back and postural pain, Mastitis, dysfunction, and Scoliosis. Fun fact: Shana-lee is a qualified coach in women’s artistic gymnastics .In her spare time, Shana-Lee loves spending time with her husband and her three sons. When she is not running after her boys, she enjoys running and swimming and hopes to start training for another marathon soon. 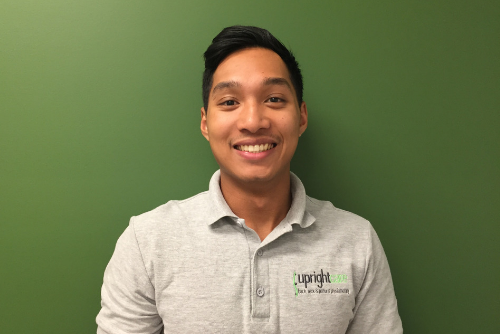 Wayne is a new addition to the UprightCare team. He is a highly skilled chiropractor and manual therapist specialising in headaches, neck and back pain, and postural problems. He treats in a manner that is very complimentary and consistent with the approach taken by our physiotherapists. 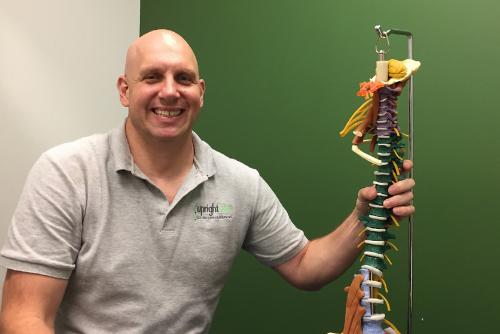 Wayne is also trained and licensed to adjust the full spine, when indicated. He is an evidence-based practitioner, who treats in a very conservative manner and loves interacting with our patients. Wayne has known Larry for the past 20 years and shares a similar treatment philosophy and passion for achieving the best health outcomes for our patients. He has a background in competitive sports, having played both college level soccer and tennis in the US. Previously, Wayne worked as an investment banker on Wall Street for 15 years and consequently understands the toll of corporate life. Wayne has recently volunteered as a chiropractor in West Bengal, India, where he worked at several clinics serving severely underprivileged rock-breaking and tea picking workers. These patients were suffering from crippling musculoskeletal injuries from many years of hard labour. Fun fact: Wayne is the drummer for a 1970s cover band! Niki is an aerial yoga and yoga instructor, massage therapist and an admin and clinical research assistant. Practising yoga since she was 15, Niki loves sharing yoga with others. Her style is relaxed and fun and focusses on flexibility, core strength, balance and relaxation through movement. Niki’s classes also feature breath-work exercises (pranayama) and mindfulness techniques. 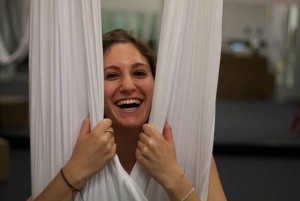 UprightCare is one of the only physiotherapy clinics using aerial yoga as an adjunct to treatment. 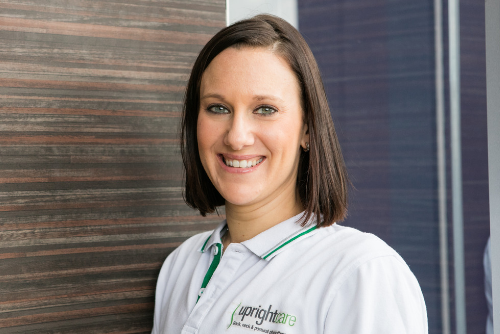 Niki works with our physiotherapists to help patients with injuries as well as function and mobility issues. Prior to joining the health world full time, Niki was a designer and has brought this appreciation of shape, form and function of the body to our clinic. Fun fact: Niki loves hanging upside down and doing the Bondi to Bronte walk. Currently studying remedial massage therapy and loving it! 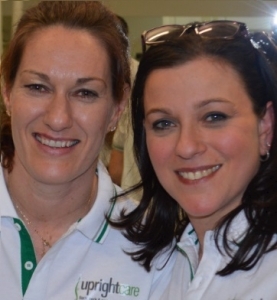 Carol and Larissa are the backbones of UprightCare and help to support our team and our wonderful patients. Stooping spinal posture: If you can’t measure it, you can’t manage it.